Quick Note: We're currently in beautiful Hawaii soaking up the sunshine - but luckily I did plenty of cooking and baking before we left to share a few recipes with you! Keep up with our adventures while we're away by following us on Instagram or Facebook! I'm a serious chocoholic. Always have been, always will be. I don't discriminate when it comes to chocolate. If it's gluten free, I'll eat it.... but when I'm looking for a healthier chocolate treat, these are one of my favourites. These Fruit, Nut and Chocolate Crunch Bars are like a healthier candy bar. 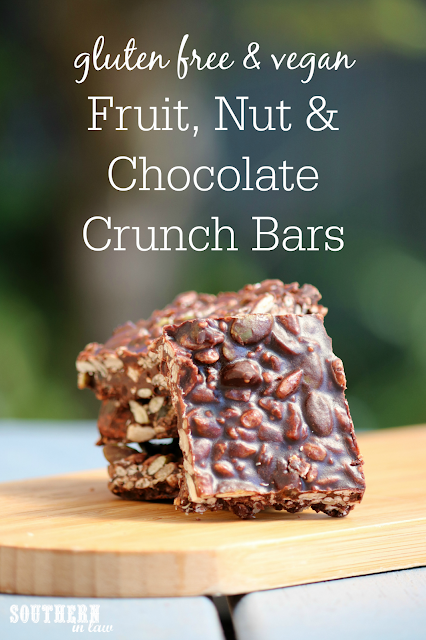 They have crunchy cereal, chewy fruit pieces and so much flavour... you'd never guess they were sugar free or vegan! They take just minutes to make and can be made in a huge batch to freeze and enjoy whenever you feel like it. You can use your favourite cereal or whatever you have on hand and add in any mix ins your heart desires. For this batch, I used a gluten free muesli with chopped dates, banana chips, sunflower seeds, pepitas, walnuts and almonds - but I've also made big batches with puffed rice cereal (like the CRUNCH chocolate bars) and whatever other cereals I've had in the pantry. Place your cereal in a medium sized mixing bowl and set aside. Place your cocoa powder in a small bowl and set aside. Add your coconut oil and maple syrup to a small saucepan and heat over a medium-low heat until your coconut oil is melted. Pour your melted coconut oil mixture into your bowl of cocoa powder and mix until combined. Pour your chocolate mixture into your cereal, mixing until all of your cereal is coated. Pour your coated cereal mix into your prepared tin and spread out the mixture to form an even layer. 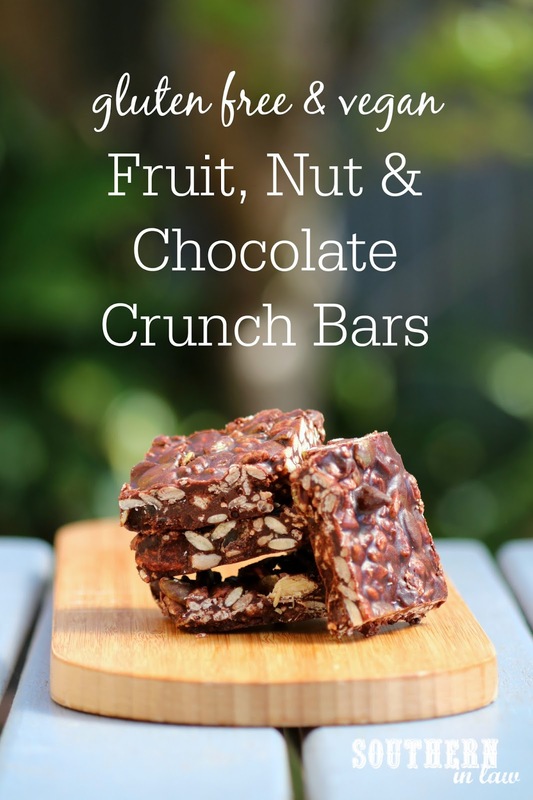 Place your tray into the fridge or freezer and chill until your bars are hard and set. Once your bars have set, cut them into pieces and enjoy immediately - or store them in the fridge or freezer to eat later. This slice will keep in the fridge for a week or so and can be frozen to last longer. If freezing you can eat it straight out of the freezer. 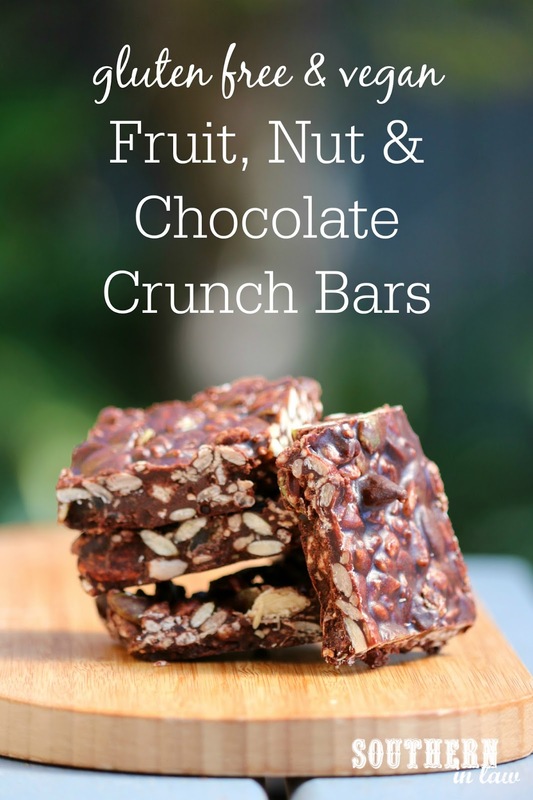 *Note: If your cereal doesn't have dried fruit or nuts in it, use about 1 1/2 cups of cereal and 1/2 a cup of nuts/seeds/dried fruit - or just make chocolate crunch bars! It's totally up to you! But tell me, are you a chocolate fan? What's your favourite kind of chocolate bar/block? And what was your favourite chocolate bar as a kid? I love Lindt 90% dark chocolate which I eat daily - but I won't say no to any kind of chocolate. As a kid, Milky Bar used to make this Cookies and Cream Chocolate block which was white milkybar chocolate and oreo pieces and that was my favourite!